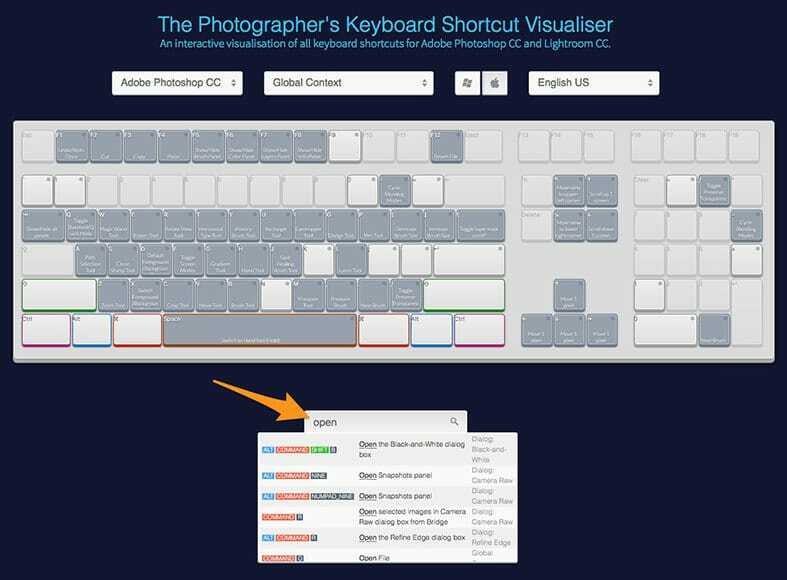 An interactive visualisation of all keyboard shortcuts for Adobe Photoshop CC and Lightroom CC. The Lightroom Shortcuts & Photoshop Shortcuts Keyboard shows you all the shortcuts needed to operate the Adobe Creative Cloud Photography Plan software as efficiently as possible. The keyboard may look a little confusing at first, but it's actually very simple to operate. The main thing that may not be immediately obvious is that you should type on your actual keyboard, as opposed to the virtual shortcuts keyboard above. Select Adobe Lightroom CC or Adobe Photoshop CC in the drop down menu. Choose the specific tool set/workspace you require. If you don't know this, just ignore it. 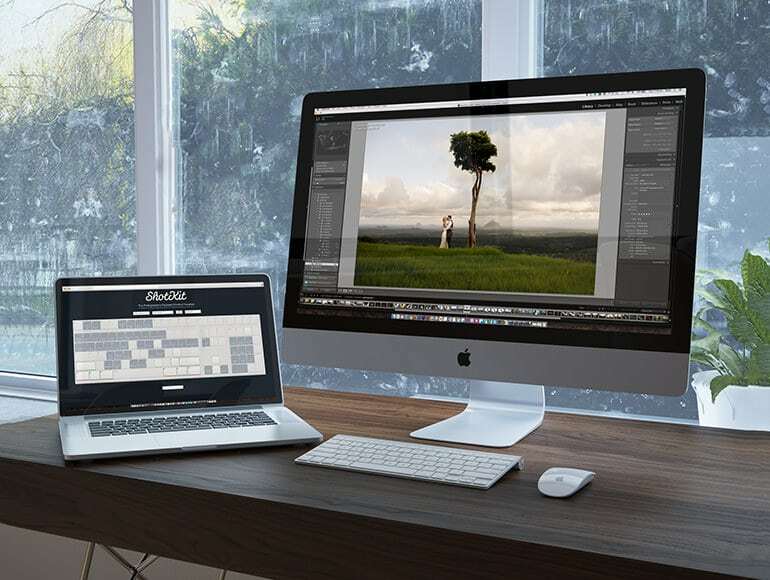 Choose whether you want to view Lightroom Shortcuts & Photoshop Shortcuts for PC or Mac. Hold down any button highlighted with a border colour (/e/g Ctrl, Alt, Shift, Space etc.) to see all the available shortcut keys associated with it. The easiest option to use the Lightroom and Photoshop Shortcuts Keyboard is to start typing the action you'd like to perform in the search bar of the shortcuts keyboard and all the available Lightroom or Photoshop shortcuts will appear. By far the easiest way to use the shortcuts keyboard is to start typing your desired action into the search bar. Why use Lightroom & Photoshop Shortcuts? Being able to perform commonly used functions with keyboard shortcuts rather than using your mouse can add up to hours of time saved. If you watch any adept professional photographer at their computers, you'll see them using a combination of Lightroom and Photoshop keyboard shortcuts together with their mouse for the most efficient editing workflow. As photographers, it's a sad truth that we often use Adobe Lightroom and Photoshop even more than we use our cameras! To maximise your efficiency in front of your computer, it's important to use Lightroom and Photoshop shortcuts that can speed up your workflow. Remembering all your most used Lightroom and Photoshop shortcuts for Mac and PC can be a challenge, and discovering new ones isn't easy.... hence the creation of this virtual keyboard! I hope you find it useful. Please use the share buttons located to the left of this page to tell all your friends about it, and don't forget to sign up to the Shotkit Newsletter to gain access to all the exclusive content not shown on the site. The ideal setup for the Lightroom Shortcuts | Photoshop Shortcuts keyboard would be to have 2 monitors, allowing you to refer to the shortcuts at any time whilst using the Adobe CC Photography suite. If you'd prefer to have all the Lightroom and Photoshop shortcuts printed out to have on your desk beside you when you work, just enter your email below to be sent a link to download a Lightroom & Photoshop Shortcuts PDF. Whichever way you decide to use shortcuts in your favourite Adobe applications, just make sure you keep learning new ones. Every time you perform an action in either Lightroom or Photoshop more than twice in one session, you really should know the shortcut. Shortcuts can really speed up your workflow and help to maintain efficiency when post processing. Grab a copy of the free Shotkit Lightroom & Photoshop Shortcuts PDF now. Download a FREE Lightroom & Photoshop Shortcuts PDF to print out and leave on your desk for easy reference.